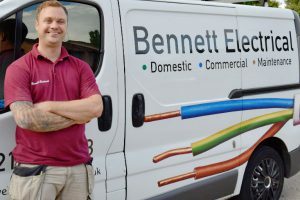 Steve Bennett provides electrical services to homeowners, landlords and businesses in the Horsham and Crawley area, and across West Sussex and Surrey. Steve is a qualified electrician with over 17 years experience, based in Horsham, West Sussex. Steve’s aim is to provide an excellent service to his customers. He listens carefully to the customer’s requirements, explains clearly what he is doing, and is respectful of the customer’s property, always working in a safe and tidy manner. Safety is Steve’s Number One priority. Steve is Part P registered with Elecsa NICEIC. Steve Bennett Electrical is fully insured. 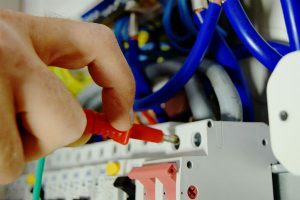 Part P states that anyone carrying out electrical installation work in a home must make sure that the work is designed and installed to protect people from fire and electric shocks. It means that his work meets the British Standard for fixed electrical installations in dwellings and associated buildings. Steve Bennett Electrical is inspected annually to ensure adherence to this standard. We have used Bennett Electrical for all our electrical needs. Always a kind and helpful service with fantastic results. A very trustworthy company. We recommend Steve to all our friends and family and would not use anyone else. "Steve has carried out a number of electrical jobs at our house. These include installing two outside lights and fitting a remote control switch for our patio lights. He has also carried out a full test of all our electrical equipment and provided a certificate to demonstrate that everything is safe." Bennett Electrical came to change out a number of spotlights for LED spotlights. The cost was very reasonable. Clean and very friendly. Highly recommended! "I can highly recommend Steve. Not only has he done jobs for me but also for landlords of rental properties that I manage as part of my business. He is quick to respond to emails and supply quotes, he offers good value for money and is friendly and helpful." By far the best electrician (and trades person for that matter) I have ever used. Steve was friendly, efficient and great value. I will be using him again. Thank you for ensuring that my wife's garden lighting plans came to fruition. She was absolutely over the moon with the results for both the decking and the uplighters around the garden. Your work was timely, competitively priced and you left the place tidy. Always a sign of a good tradesman. I woud have no hesitation in recommending your services to others who are looking for something similar and hope we can call on your services again in the future. We hired Steve to change our fusebox. He was reliable and tidy and his work was top notch. Will be using him again and would recommend him to anyone looking for a first class job. I just wanted to write a thank you for the work completed on our kitchen. Your professional approach was impressive and you always arrived when you said you would. The work was done with little disruption and your attention to detail was superb. We have no hesitation in recommending your services to anyone who needs electrical work completed with superior results.